Sudhansu Chokroverty, M.D., FRCP, is currently Professor and Director of Sleep Medicine Research, and Co-Chair Emeritus of Neurology at JFK New Jersey Neuroscience Institute , Edison, NJ. He is also Professor of Neuroscience at Seton Hall University School of Graduate Medical Education, South Orange, NJ, and Clinical Professor of Neurology at Robert Wood Johnson University Medical School, New Brunswick, NJ. 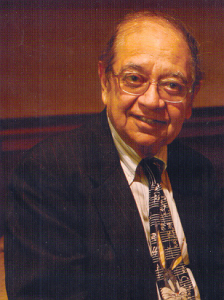 After graduating in Medicine from Medical College, Calcutta and University of Calcutta, India, Dr. Chokroverty had post-graduate training in internal medicine and neurology in hospitals in the United Kingdom (UK). After being certified in Internal Medicine, he became a Member of the Royal College of Physicians of UK (MRCP) and later a Fellow (FRCP). Residency training in neurology and fellowship training in neurophysiology took place at Northwestern University Medical School, Chicago, IL, and Hines VA Hospital, IL. Dr. Chokroverty is board certified in neurology, electrodiagnostic medicine, sleep medicine, and clinical neurophysiology. He has examined for the American Board of Psychiatry and Neurology, the American Board of Sleep Medicine, the American Board of Clinical Neurophysiology, and the American Board of Electrodiagnostic Medicine. Dr. Chokroverty is the Founding and Past President (two terms) of the World Association of Sleep Medicine, (WASM), and the Founding Editor-in-Chief of the journal Sleep Medicine, an International Journal devoted to clinical Sleep Medicine. He was a member of the Advisory Board of the National Center of Sleep Disorders Research of the National Institute of Health (NIH) and the Medical Advisory Board of the International Restless Legs Syndrome Study Group, and Chair , AAN Sleep Science Award Committee, Chair, VA Research and Development Committee, Chair, AAEM (EMG Society) Marketing and Public Relations Committee, a Visiting Scientist, Ministry of Health, Singapore and Neurology Delegate Leader, People-to-People International Citizen Ambassador Program. He is the recipient of WASM Award for Excellence, Indian Sleep Disorders Association (ISDA) Oration, AAN-AINA Life-time Achievement Award, the Archbishop John J. Meters outstanding Education Award from Seton Hall University, and American Association of Physicians of Indian Origin-Sleep(AAPIOS) Life-time Achievement Award. He has participated in numerous national and international conferences as lecturer, session chair, continuing medical education course director and grand round speaker. He is the author or editor of twenty-five published books and two in press including five books he has written for the general public. Twenty-three of these twenty-seven books deal with sleep disorders medicine.�� He has published extensively in both national and international scientific journal producing over 320 papers and book chapters, over 200 abstracts, and has made over 365 presentations at national and international conferences. Dr. Chokroverty�s recent research interest has focused on sleep and movement disorders; restless legs syndrome; sleep disordered breathing in neuromuscular disorders; autonomic failure and neurodegenerative diseases; and actigraphy in insomnia.